The morning did not start off promisingly. I was working from home, which should have made life easier. It didn’t. There were the usual raft of IT problems to contend with and then several ‘urgent’ jobs landed and began kicking off, which meant I was running late. We’d ordered some blinds for our bedroom which needed collecting from the TNT depot (which just might be the least user-friendly place on earth to collect a parcel from), so between crisis fighting from a distance with work things, trying to cram a ludicrously long package into the boot of my Honda Civic, and dashing to collect Seb from work, I was stressed out and on the edge of being late by the time we got to the hospital. Plus, you need a full bladder for the ultrasound to work, and I had to pee just before we left the house – traitorous bladder. So I was chugging water in the car like a madwoman! You know I’ve been struggling to feel the kind of connection I felt I should to this little thing growing inside me. Its all felt very abstract so far, and my lack of any symptoms other than a bit of tiredness has made me feel as if its not happening at times. I’ve felt as if it was something happening to me rather than something I was a part of. I’ve focused more on what its going to stop me doing than what its going to give me. I did want this, but a lot of my feelings so far have been that I’m just not ready – even though that’s ridiculous. And then I’ve realised how many women struggle badly to become mothers and I’ve felt bad for feeling the way I do. Waiting to go in for the scan, I took a glance round at the other mums to be and wondered whether I’d find myself on the same ward as them in future! Can’t wait to get some mummy friends, especially because none of my friends have children yet. Then suddenly, it was our turn. I didn’t know what to feel, what to think. First she scanned my ovaries – no cysts or abnormalities. Phew. Then, without warning, there was a baby on the screen. Such an odd mixture of emotions came over me. Part of me wanted to laugh at the sheer ludicrousness of the situation – a little face suddenly peering back at me. Part of me was shocked that it really looked like a baby (I was expecting more….tadpole?). 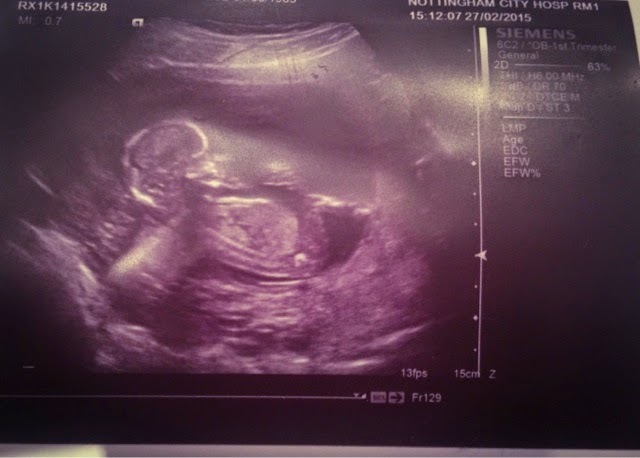 Part of me was shocked there was a baby in there at all – I’ve been having a recurring fear that they’d scan me and decide there wasn’t anything in there! But the biggest part of me was just…happy. Gently happy. It wasn’t like I burst into tears. I just smiled and felt truly awe-struck. But the baby appears to already be stubborn, just like its Dad. It would not get into the right position for them to do all the measurements. The nurse made me dance – I kid you not- around the scanning room. It kind of felt like there would be a candid camera moment out of that! It still wasn’t working, so I got sent for a sugary drink and a walk around the grounds. Still refusing to shift…I hope this isn’t a sign of things to come. By that point, with the sugary drink on top of all the water I’d been downing, I was fit to burst, so when she told me I could go to the toilet and see if that helped, I could have kissed her. Thankfully, that did the trick and the baby could finally be measured – 13 weeks and 3 days! So the midwife was pretty accurate. At the end, the baby was sat up like a meerkat and it almost seemed to hang its head and sigh, like we’d poked it around enough and it wanted to get back to sleep! Then the usual round of bloods – for someone with a morbid fear of needles, I’m rapidly getting used to the pincushion treatment. It was only later that night, when I couldn’t stop clutching the printed out picture from the scan, that it hit me how much seeing the image of that little face on screen had changed how I feel. It’s gone from an abstract possibility to feeling like ‘mine’, a real person about to happen. Its ignited my curiosity – what does it look like? What is it thinking in there? My thoughts have rocketed from ‘me’ to ‘we’. And Seb says that whereas before I didn’t talk much about it, it was ‘baby this’ and ‘baby that’ after the scan – like it finally became real to me. In many ways, it was just what I needed. Have you had your first scan yet? How did it make you feel? Did you feel a connection with the baby before you saw it for the first time? Love this post! It's so honest & beautiful :) can't wait to read your journey! !